By the time Las Vegas’ new NHL franchise selects a Detroit Red Wings player in the 2017 Expansion Draft, it will have been 17 years since the NHL last expanded. On June 23, 2000, Minnesota and Columbus drafted their teams, bringing the number of NHL franchises to 30. It will be interesting to see who the Red Wings protect in the upcoming expansion draft. They’ll have the option to protect either one goalie, three defensemen, and seven forwards or one goalie and eight total skaters. Will Detroit expose veterans or prospects when Las Vegas makes their picks? Or will the Red Wings try to negotiate who Las Vegas selects? In an attempt to gain insight into Ken Holland’s player protection strategy, let’s take a look at the past three expansion drafts and see who Detroit did and did not protect. Protected: Mathieu Dandenault, RW; Kris Draper, C; Sergei Fedorov, C; Slava Kozlov, LW; Martin Lapointe, RW; Igor Larionov, C; Kirk Maltby, LW; Darren McCarty, RW; Brendan Shanahan, LW; Steve Yzerman, C; Anders Eriksson, D; Yan Golubovsky, D; Nicklas Lidstrom, D; Larry Murphy, D; Aaron Ward, D; Chris Osgood, G.
Exposed: Pavel Agarkov, RW; Doug Brown, RW, Sylvain Cloutier, C; Brent Gilchrist, C; Mike Knuble, RW; Joey Kocur, RW; Toivo Suursoo, LW; Slava Fetisov, D; Jamie Macoun, D; Dmitri Mironov, D; Bob Rouse, D; Kevin Hodson, G; Norm Maracle, G.
Nashville’s Selection: Doug Brown, RW. Analysis: When it came to forwards, Detroit did not have much wiggle room when deciding who to protect. 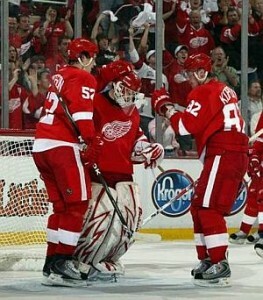 Coming off of a fantastic Stanley Cup Finals performance, the Red Wings were sorry to see Brown go. So sorry, that they immediately traded back for him following the expansion draft. Detroit traded prospect Petr Sykora, their 1999 third round pick, and a conditional draft pick to Nashville to re-acquire Brown. Tomas Holmstrom required protection in the 1999 expansion draft after being exempt the previous year. After an NHL franchise was awarded to Atlanta, they tapped Detroit Assistant General Manager Don Waddell to become the team’s GM. Having terrific knowledge of Detroit’s roster and farm system, Waddell had the opportunity to make a great pick when it came to choosing from the Red Wings’ exposed players. Ken Holland had to carefully decide who to protect. 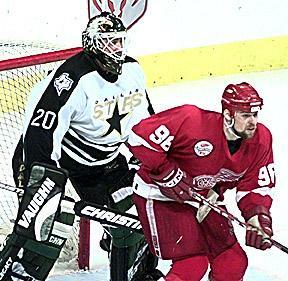 Protected: Draper; Fedorov; Tomas Holmstrom, LW; Kozlov; Lapointe; Maltby; McCarty; Shanahan; Yzerman; Chris Chelios, D; Dandenault; Lidstrom; Murphy; Ward; Osgood. Exposed: Agarkov; Brown; Wendel Clark, LW; David Engblom, C; Gilchrist; Petr Klima, RW; Kocur; Larionov; Barry Potomski, RW; Andrei Samokvalov, C; Anatoly Ustugov, RW; Todd Gill, D; Sean Gillam, D; Golubovsky; Doug Houda, D; Uwe Krupp, D; Macoun, D; Ulf Samuelsson, D; Maracle. Atlanta’s Selection: Norm Maracle, G.
Analysis: Likely knowing Atlanta wanted to go young with their picks, Detroit exposed lower-end prospects, veterans, and unrestricted free agents. Clark, Klima, Gill, Houda, Macoun, and Samuelsson were all pending UFAs at the time and none were expected to re-sign in Hockeytown — though Gill was re-acquired the following season after signing with Phoenix. In Maracle, the Thrashers selected a prospect goalie with some upside…at the time. Maracle would play 46 games with Atlanta over three seasons — and winning only six games — before heading overseas to continue his career. This also opened the door for the Red Wings to acquire Manny Legace, who would go on to have a much more prosperous NHL career. In the summer of 2000, the NHL welcomed two more teams: the Columbus Blue Jackets and Minnesota Wild. With the addition of these two teams, the number of NHL franchises reached an even 30. And with two franchises joining the NHL, the Red Wings were going to lose two players in the expansion draft. Protected: Draper; Fedorov; Holmstrom; Kozlov; Lapointe; Maltby; McCarty; Shanahan; Yzerman; Chelios; Dandenault; Steve Duchesne, D; Lidstrom; Ward; Osgood. Exposed: Agarkov; Brown; Engblom; Johan Forsander, LW; Gilchrist; Alexandre Jacques, RW; Kocur; Darryl Laplante, LW; Larionov; Stacy Roest, RW; Ustugov; Pat Verbeek, RW; B.J. Young, RW; Gill; Golubovsky; Krupp; Maxim Kuznetsov, D; Murphy; David Arsenault, G; Manny Legace, G; Ken Wregget, G.
Minnesota’s Selections: Darryl Laplante, LW, and Stacy Roest, RW. Analysis: When it came time to draft players, Columbus and Minnesota alternated picks, but could choose from any team. Minnesota ended up taking two Red Wings prospects: Laplante and Roest. Despite solid AHL careers, neither would have much of an impact in Minnesota. Roest put up 43 points in 125 games and Laplante would be dealt to Boston in 2002 without ever playing a game for the Wild. Because Holland cannot protect as many players in the Las Vegas expansion draft as in previous years., the Red Wings are likely to lose a decent player. 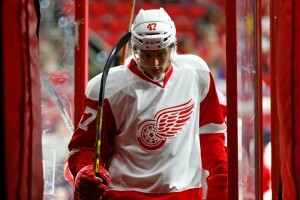 But, despite the quality of players the Red Wings will have to expose, they will only lose one player. Judging by what he’s done previously, Holland will likely expose veterans in the expansion draft, despite his affinity to sign them. He’s also done a good job protecting quality prospects in the past, so don’t expect Andreas Athanasiou, Anthony Mantha, or Alexey Marchenko to head out west next summer. There’s also a chance Holland could negotiate a certain selection or immediately trade back for the chosen player after the draft. Keep calm, Hockeytown. Everything will work out just fine. Which Red Wings would you protect leading up to the Las Vegas expansion draft? Comment below with your picks.